Watsonias are sun loving plants from Southern Africa. They are mostly half hardy and only grow outside in warmer UK gardens, and the Beatrice Watsonia is one of the best to grow in the UK. 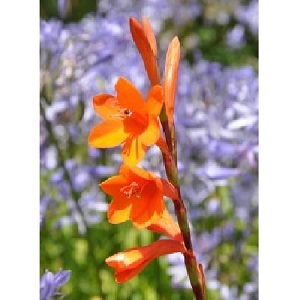 It grows strap-shaped leaves and tubular orange-red flowers in late summer, from August to September. Plants grow to a height of about 1m and are good in borders, banks and Mediterranean gardens. They grow well in containers. Good cut flowers. Plants grow best in full sun and a sheltered location, hardy to about -5°C. Only grow outside in the warmest UK gardens, such as Cornwall and sheltered gardens in inner cities. Otherwise grow in pots and shelter from frost over winter. Plants are naturally evergreen but may lose their leaves in winter and regrow in spring from their corms. Pack of 10 seeds. Sow seeds in spring or autumn. There is some natural variation in flower colour in plants grown from seed, and flowers may rarely appear in pink or red. Flowering from second or third year. Sowing instructions and a colour photo are printed on the packet. Sow in spring or autumn 3-4mm deep in deep (at least 10cm) small pots of compost. Cover with sand and keep at 15-20 degrees Celcius and germination takes 3-4 weeks. Transplant seedlings into pots and overwinter in a greenhouse. Plant out in the second season, when flowers will start to appear. Deadhead to encourage more flowers. This is a half hardy plant which can tolerate a mild winter frost. Mulch outside plants well in winter. Move container plants into a greenhouse over winter. Leaves may die down in winter and start growing again in spring, unless exposed to hard frosts, in which case they may die. Divide the corms (remove offsets) every 5 years or so. See Growing Advice for more information on growing Watsonias.